Get ready to “amigurumi-fy” your Christmas trees with these adorable round teddies all bundled up in their colourful scarves! Whether you prefer pandas, koalas or ordinary teddies, they’re sure to add a touch of cuteness and craftiness to your trees this season! ***You can purchase an INEXPENSIVE AD-FREE PDF of this pattern on Etsy HERE and on Craftsy HERE! The printable PDF with step-by-step pictures has been condensed into a total of 5 pages including the cover page and also includes the Bunny Ornament Pattern too! ***Please follow along with MY BLOG POST HERE to see step-by-step photos. 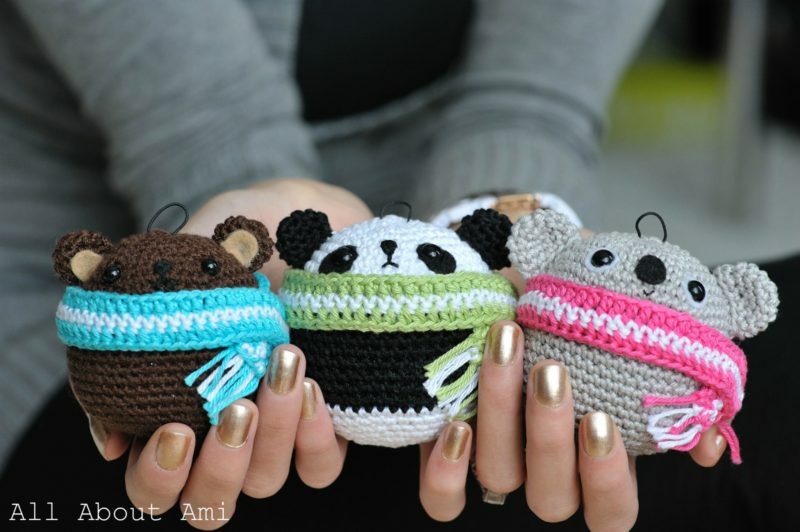 If you are new to crochet, please see my “Amigurumi for Beginners” and “How to Read Amigurumi Patterns” blog posts! The How to Read Amigurumi Patterns post actually breaks down this specific teddy pattern round by round so you can see where to work your increases and decreases! R9-20: Sc 48 ***For Panda, change to black yarn after finishing Row 11. Then switch to white yarn after finishing Row 19. Attach safety eyes (for panda and koala, cut eye roundies from felt, make a small x, and place safety eyes through before attaching). Embroider nose and smile with embroidery floss. Begin stuffing head. (For Panda, R1-11 are white, R12-19 are black, and R20-27 are white). R1: Starting in third chain from hook, half double crochet (hdc) 60. Fasten off. R2: Join middle colour (white for my scarves) with sl stitch in first stitch. Ch 1. Sc 59. Fasten off. R3: Join original colour (from Row 1) with slip slitch in first stitch. Ch 2. Hdc 59. Fasten off. Add fringe. See my photos here or video here on how to do this. Trim fringe to desired length. Glue or sew scarf around bear just below mouth to make them cozy and snug. R1: 5 sc in Magic Ring. * Loop black cord through top of teddy’s head. Tie the ends in a knot and hide it in teddy’s head. Attach teddy ornament to tree with ornament hooks. 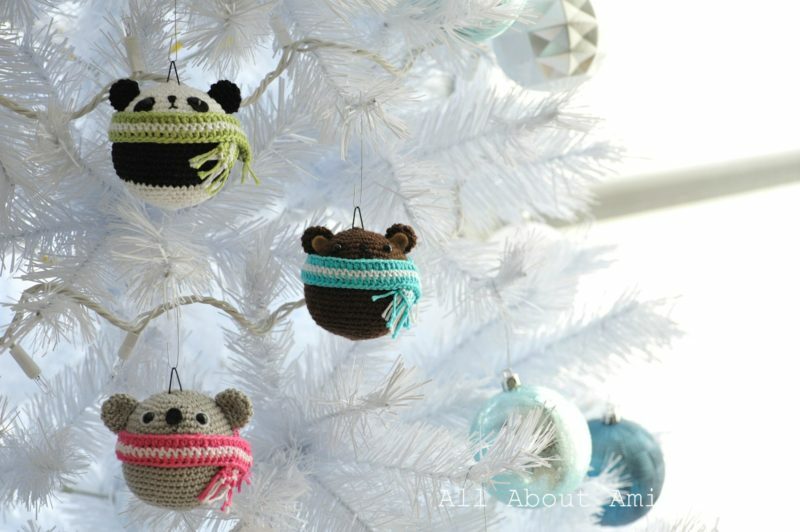 * Or, make a series of chain stitches and use it to attach teddy to the tree. Have a very blessed and Merry Christmas, everyone 🙂 May these teddies bring some warmth, joy and love into your homes this season! I would love to see your versions of these teddies on your tree, so please send me photos of your work through my e-mail (all_about_ami@hotmail.com), facebook page or twitter! ***Get the Dutch translation of this pattern HERE! This pattern is an original pattern by Stephanie Lau of All About Ami (December 2011). Please do not claim this pattern as your own. If you wish to share this pattern, you may link to this pattern but please do not reprint it on your site. You may keep a copy for your own personal use but please DO NOT sell the pattern or distribute it.